A Commitment to Service . 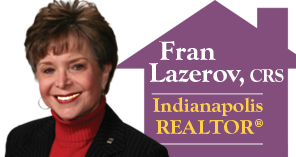 . .
Fran can help you find a home or investment property. Her extensive background and constant continuing education keeps her informed on current financing, real estate law and contracts, and current market conditions. This degree of sophistication and knowledge is what makes a professional. Fran will provide a comprehensive market analysis of your property. She takes the time to qualify buyers to avoid wasting your time and the buyers. She is also qualified to help you find a REALTOR¨ in another town if you are relocating, free of charge. She is committed to a thorough, creative MARKETING PLAN personalized to your property for a timely sale. Started in the Summer of 1967— 50 years!